For this issue I set out to find pre-17th century cookie recipes that you can make at home. What we think of as a cookie is basically a small cake that is baked until crispy. Very few recipes for these dainty snacks exist prior to the 16th century. There are references to shortbread dating back to the 12th century but the majority of cookie recipes show up in European cookbooks in the 16th century when sugar was easily available and prices went down. Pistachio, Anis, and Lemon Biscotti, Anis Sugar Cake, and Savoiarda. Of course the term cookie is relatively modern. In the Renaissance and later periods, snack foods like this were called biscotti, biskets, bisketellos, rusks, spritzkuchen, wafers, jambals, drops, puffins, cracknels, morsels, and many other names. Many of these early recipes are still being made today with only minor modifications. The earliest recognizable recipe for a cookie is Ciambella de Monaco from Libro de Cucina, 1390, which is an ancestor to our Vanilla Wafers. Ciambelli were made from only flour, sugar, and eggs. Lots of eggs by today's standard. In fact one recipe calls for 20 eggs! This makes sense because Medieval cooks needed to preserve foods when they were plentiful, so they made dried cakes from eggs that could be saved for up to a year without spoiling. The wafers could also be crushed to make a kind of sweetened, protein powder to add to pies, stews, gravy, pudding, and other dishes. 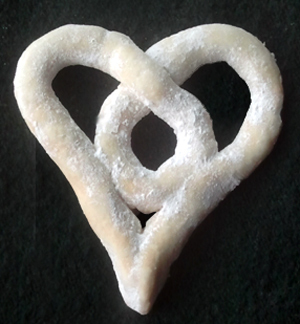 Bartolomeo Scappi, head Cook to the Pope (1570) includes crushed mustaccolli (a Milanese biscuit) in dozens of recipes. Biscuits du Roy from The Accomplisht Cook, (1660) were made from a no-butter Sponge Cake batter and flavored with anis seed. They are described as being dropped from a spoon working as fast as three people can and making them round in shape. The Royal cook to the King of France, La Veranne (1615) describes the same batter being drawn on paper in lines the length of a finger. In the 18th century they were called Fine Savoy Biscuits (The Complete Confectioner, Fredrick Nutt 1790) and were spread with a spoon in bar shapes. By the 19th century baker's used a pastry bag to pipe them onto buttered parchment and called them Lady Fingers. To this day, they can be found in cookbooks under that name. These cookies were variously flavored with ground almonds, citrus zest, anis, sweet spices, or simply made plain without any flavoring at all. Since it is important to remove all the moisture from these cookies so they will store well, this recipe includes a second baking at 250° to dry them out completely. It also gives them a delectible, crisp texture. These crispy Lady Fingers are wonderful when served with fresh fruit and sweetened yogurt or whipped cream. Heat the oven to 350°F. Cover two cookie sheets with baking parchment andcrease or draw lines on the parchment 3" apart. You will use these as guides. Grease the paper. In a medium size bowl beat the egg yolks and half the sugar for 5 minutes on the highest speed, until it is very light in color and double in volume. It should fall in ribbons from the beaters. Mix in the flavoring. Set aside. Change to the whisk attachment on your mixer and, in a different bowl, beat the 6 egg whites until they form fluffy clouds but not peaks. Add the other half of the sugar, a little at a time beating until you have a glossy, stiff merainge. Fold the whites into the rest of the batter until it is all a uniform shade of pale yellow. Then sift in the the flour and salt, mixing it in a little at a time. Take a large pastry bag with a 1/2" round tip or a gallon-size zip-lock bag and prop it up in a large beverage cup or a coffee can. Spoon the batter into the bag. This is one time that I prefer a zip-lock bag to a pastry bag. Zip it shut keeping as much air out of the bag as possible. If using a plastic bag, cut off one of the bottom corners so that you have a hole about the size of the end of your pinky. Draw lines with the batter on the parchment about 1 1/2" apart and 3" long using the pencil lines as guides. Use a small strainer to dust them with powdered sugar. Bake for 10 to 15 minutes or until they have turned a light-brown color and have lost their gloss. Remove from the oven and immediately take a flat spatula and cut them from the paper. Put the wafers on wire racks to cool. Turn the oven down to 230°F and when it has cooled, put the lady fingers back in the oven to dry out for 60-90 minutes. Makes 36-40 cookies. Here is a good video on Lady Fingers. There are many early recipes for biscotti (twice-baked cookies) and they all boil down to some kind of sponge cake recipe baked in thin cakes that are cut into slices no thicker than your finger, then toasted in a slow oven. The slices were toasted so that they could be stored up to a year without spoiling. Biscotti were meant to be eaten dipped in wine, the way we dip chocolate chip cookies in milk. And I must admit that they are really delicious with sweet red wine. 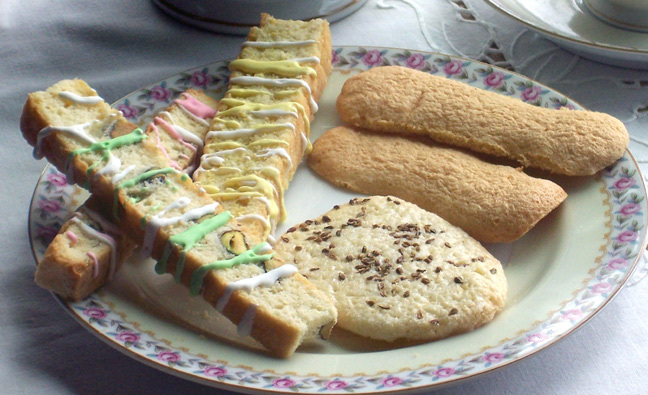 Biscotti can be served glazed with Royal icing or simply dusted with confectioner's sugar. Three Flavors of Biscotti with Royal Icing. Preheat the oven to 350° F. Shave the lemon zest, and measure the anis seeds and pistachios and place them in three small bowls. Grease three 8" round cake pans and line the bottoms with parchment. Put 2 tablespoons of the confectioner's sugar in a small bowl and have a wire strainer ready. Whip the warm eggs (minus one egg white for the glaze) with the sugar until foamy with an electric mixer. Whisk together the flour and salt and fold it in a little at a time. Fold in the melted butter. Pour one third of the batter into each pan. Gently stir pistachios into the first cake, anis seeds into the next, and the lemon zest into the last. Put the confectioner's sugar in the strainer and sprinkle the tops of the cakes. Bake for 20-30 minutes or until a toothpick comes out clean and the cakes are just separating from the sides. Remove from the oven and allow to cool for five minutes then turn them out onto a wire rack and let them cool completely. Slice a piece off each side of each cake to make them square. Cut 1/2" slices out of each square and lay the slices flat on cookie sheets. Bake at 250° F for 1 to 2 hours or until they are dried out and a little toasted on the edges. Put the slices on a wire rack to cool while you make some royal icing. Whip the egg white and add the rest of the confectioner's sugar on high for two minutes, the icing will be runny. Dip a fork into the icing and drizzle a little white icing on all the biscotti. Divide the remaining icing into three bowls and add only one drop of green, red, or yellow liquid color into each dish. Mix in the color until smooth and drizzle the green icing on the pistachio biscotti, yellow on the lemon biscotti, and pink on the anis biscotti. Store in a tin box between sheets of paper after the icing is dry. Serve with wine, tea, or coffee. Makes 17 biscuits of each flavor or 51 biscotti total. Paste Frolla, under various names, was used to make crusts for pies and tarts before the 16th century but was so common that cooks didn't bother to write down the recipe until the end of the 16th century. In the Opera of Bartolomeo Scappi, (1570) Scappi describes a pasta fatta di fior di farina, de rossi d'oua fresche, butiro, zuccaro & acqua di rose. (fine dough made of wheat flour, fresh egg yolks, butter, sugar, and rosewater). Scappi used this paste in many recipes from fancy Peacock pies to thin custard tarts for the sick. This dough is now called Pasta Frolla, a lightly sweetened Italian shortbread. The same dough also shows up in French and English cookbooks as "pâte brisée" or "short paste" for the next 500 hundred years where it is used to make a variety of pastries including cookies. The recipe below is from The Accomplisht Cook (1660). It makes two kinds of cookies from one batch of Pasta Frolla; anis seed sugar cakes and moulded cookies called Jambals. You can use Pasta Frolla to make many different types of historic cookies by adding food coloring, nuts, honey, spices, or other flavors. You can roll it in sugar or brush the tops with egg yolks, press nuggets of dough into moulds, fry lumps in butter, shape them, or put them through a syringe (cookie press or pastry bag) to extrude different shapes for fying or baking. Heat the oven to 350° F. Grease a cookie sheet or line with parchment. Whisk the flour, sugar, and salt together in a large bowl. Blend in the egg yolks, cream, and soft butter with your hands working quickly with a pinching motion. You'll be tempted to add more liquid as you are mixing, but don't, just keep mixing. Eventually, it will form a ball with a clay-like texture. Flour a pastry slab and knead he dough a few times to make it more pliable. Divide the dough, cover half in plastic wrap and set aside for the Jambals. For Sugar Cakes: Take a lumps of dough the size of a walnuts and roll them in granulated sugar then anis seeds. Place on a greased cookie sheet. Bake for 12 minutes. The cookies should look cooked but not browned when done. For Jambals: Take the chilled dough and pat it out on a flour-dusted slab into a rectangular shape the thickness of your baby finger. Cut it into 8 long, thin strips and roll them until they look like arrow shafts. Twist the shafts into hearts, interlocking-rings, bows, or pretzels, as you desire. Brush with egg white. Bake on parchment for 13 minutes or until just a little brown. Remove from the pan with a flat spatula and cool for 10 minutes. Dust them generously in confectioner's sugar. Store in an air-tight box. Makes 18 anis sugar cakes plus 8 jambals. Links to many online resources for historical cookbooks and recipes. If you want to add this article to your list of favorites or email it to a friend, please use this permanent URL, https://stores.renstore.com/-strse-template/1307A/Page.bok. Permission is granted by the author to quote from this page or use it in handouts as long as you include a link back to Renstore.com.